Problem: Rational Method Composer (RMC) exports a process in the MS Project XML format. When loading such an XML file into MS Project users will not see all of the information exported by RMC in the default view. For example, RMC exports lists of input and output work products as custom attributes for tasks. These attributes are not displayed by default. This document describes two alternative ways of customizing your MS Project to show this missing information. In MS Project add these columns to the current view (such as the default Gantt Chart view) by using the menu Insert > Column… (alternatively just select an existing column and hit the INS key on your keyboard or right-click a column and select Insert Column from the context menu). 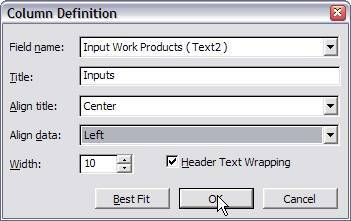 In the Column Definition dialog select the Field Name “Input Work Products (Text2)”, type a Title such as “Inputs”, and select to align the data “Left”. Repeat the last steps one more time but select the Field Name “Output Work Products (Text3)” instead. You can now arrange the columns in the views by dragging them. You can also make them wider so that they show more information. You can now save this layout as a template that can be distributed to your colleagues. Decide if you want to remove or keep all the tasks in the template. You probably want to remove them so that people can use the empty template to add their tasks from RMC. Select menu File > Save As… In the Save as Type field select *.mpt. Give the template a name and save it. This template file can now be distributed. In the simplest case people can open the template via the File > Open menu and then load the exported RMC file afterwards using File > Open again. 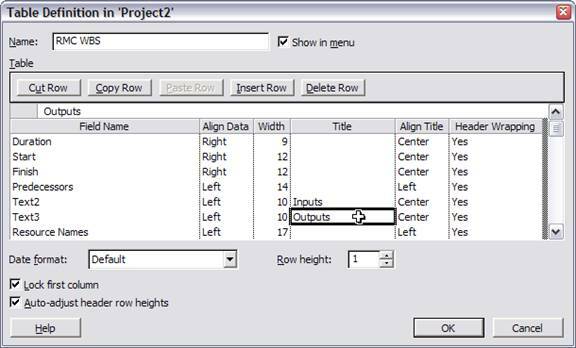 When prompted to either create a new project, append or merge select to Append. 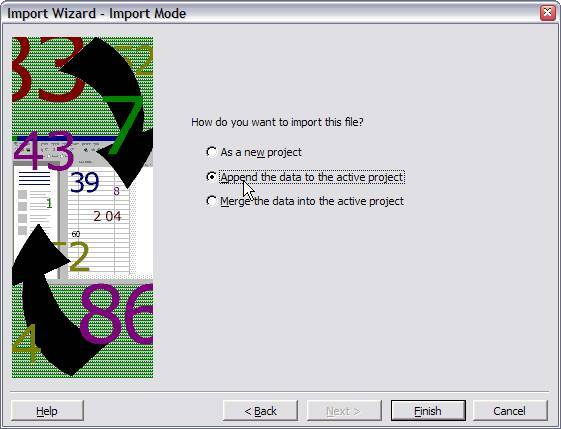 If you’re using Microsoft Office Project Server 2003, you can use the Organizer to move project elements in and out of the enterprise global template file. For example, you can create a new table in an enterprise project or even in a local project. Using the Organizer, you can copy the table to other enterprise projects. If you have appropriate privileges, you can use the Organizer to copy the table to the enterprise global template file, and then make that table available in all enterprise projects. Instead of always opening the template file first you can also add a new Table and View and make them your default when you open MS Project. Start MS Project. It should just show a new empty project. The More Tables dialog should have the Entry item selected. If not select it (or select any other table that you would prefer). In the Table Definition in <project> dialog type “RMC WBS” into the Name field. Tick the Shown in menu box. In the list below click on Resource Names and the click the Insert Row button. Click OK to close the Table Definition dialog. In the Organizer dialog select the Tables tab. The select the name of the current project in combo box of the lower left bottom. On the right select Global.MPT. Then in the left list select “RMC WBS” and click the Copy >> button to add your table to the Global.MPT. Click the Close button and then the Apply button to close the Organizer and More Tables dialogs. Select the Gantt Chart entry and click on the Copy… button. 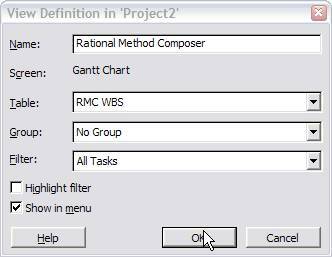 In the View Definition in <project name> dialog specify the Name “Rational Method Composer” and select RMC WBS in the Table combo box. Click OK to close the View Definition dialog only. In the remaining More Views dialog click on the Organizer button. Then in the left list select “Rational Method Composer” and click the Copy >> button to add your view to the Global.MPT. Then select the Tools > Options menu. Select the Views tab in the Options dialog. In the Default View combo box select “Rational Method Composer” and click OK to close the dialog. To test that your Rational Method Composer view is indeed your new default, exit MS Project and restart it again. 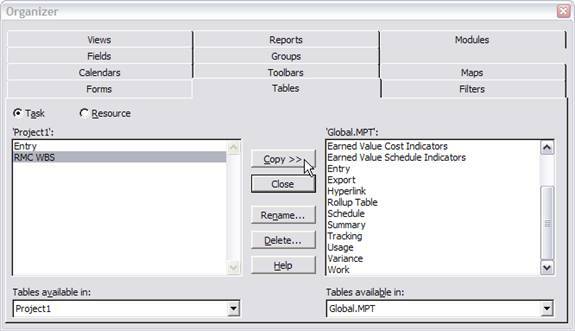 create a new MPT file to which you copy the Table and View created here. 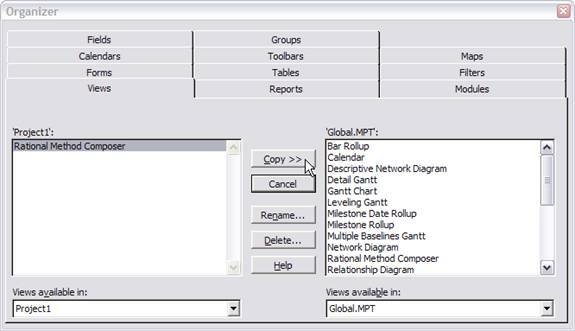 Then your team member could open this MPT file and copy the Table and View to their Global.MPT to make them the default.